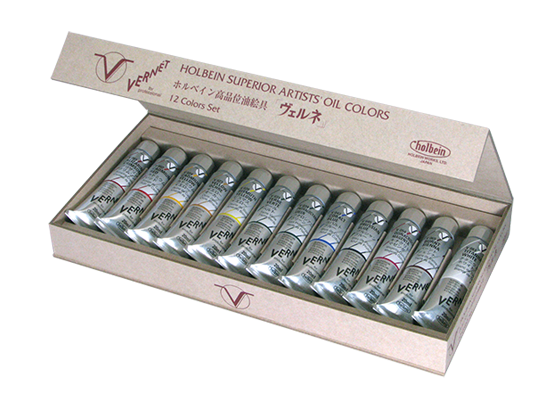 Traditional Oil Color and Holbein Vernét colors (HVC) differ fundamentally in terms of allocation ability and pigment content. Higher levels of pigment result in a higher depth of color and an increase in concealing power. An increase in pigment quality can be achieved simply in the production process. The difficulty lies in developing a method by which the paint may be dispersed. Vernét innovation is in its technology…it takes ten times the amount of time to produce one tube of Vernét compared to its standard line equivalent. The result is a fine vibrant color. Figure 1 shows the difference between the pigment content in Vernét Alizarin Crimson and an equivalent version. The fundamental grain diameter of HVC ranges from 5 micrometers to approximately 25 micrometers at the largest. On the other hand, particles run from approximately 11 to 45 micrometers in test samples. Upon looking at this data, it can be said that Vernét has approximately half the grain diameter of traditional oil color but is nevertheless spreadable over the same approximate area. If the particle content of the paint is doubled, its spreading capacity increases by eight times. As the amount of paint used is increased, we can clearly see a very large difference in capacities of each line. Through figures 2 and 3 below, we can see schematically, a comparison between the distribution abilities of the paint. If the grain diameter is halved, accordingly the paint membrane is dispersed more smoothly, resulting in a higher quality of luster. In addition, light is able to reach the color without being scattered, leaving a slight sense of transparency, increasing the depth of the color. It is in this way that the Vernét color line manages to possess an almost transparent quality and beauty. Figure 4 illustrates what happens when HVC and traditional oil color are mixed. The test sample particles are larger than HVC’s particles and therefore the HVC particles have fallen in between the larger particles. In the mixing process, smaller particles are drawn in by the large particles, like mixing layers of baseballs and ping pong balls on top of a vinyl sheet. When viewing such a sheet, the baseballs are predominantly more visible. Figure 5 illustrates covering a traditional oil color with the HVC, the surface becomes smooth, and as HVC remains fairly transparent, the paint layer under it remains slightly visible and thus taking on HVC’s trademark gloss. Choose from a number of predetermine color selections. 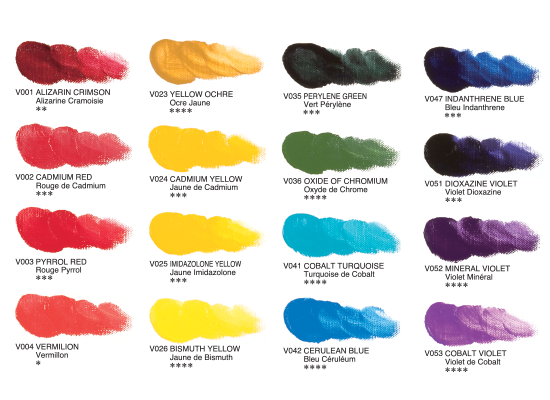 View a complete list of Vernét Colors.